Well the last Zoo2Zoo event for 2013 has been run and the Zoo2Zoo team will take of few months off, to enjoy time with our families and friends, before we start working on behind the scenes aspects for the events we are holding in 2014. If you have Zoo2Zoo ride photos or YouTube clips of the Zoo2Zoo rides you would like to see on the Zoo2Zoo website please go to our Contact Us page for further details. all, and it is great to see so many riders returning to embark on the rides we offer. The Zoo2Zoo team would like to personally thank each and every one of you (riders and event supporters) for your support, not only towards the events we hold, but your generous efforts in raising funds for the Black Dog Institute (BDI). This year the Zoo2Zoo riders and supporters have raised a massive $200,000.00 which will go towards the work the Black Dog Institute under take in the areas of Mood Disorders. This figure keeps growing even after the last event on the Zoo2Zoo calendar. Congratulations and Thank You to all our fundraisers and their supporters for their efforts in raising much needed funds for the Black Dog Institute. a special thanks to those below who have exceeded all possible expectations. 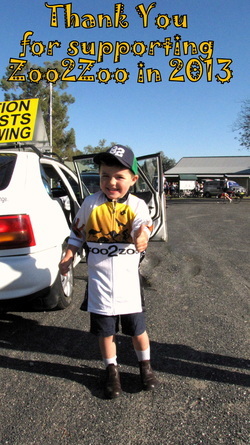 Without the support, understanding and at times patience, from our loved ones and families, we (the Zoo2Zoo Committee) couldn’t possibly achieve what we set out to achieve every year, and that is simply to provide you all with great cycling events which help raise funds and awareness for BDI and Mood Disorders. The Zoo2Zoo team would like to wish you all, your families and friends all the best for the remainder of 2013. Stay safe on the bike and remember to Exercise Your Mood. Again, thank you for your support and we look forward to seeing you in 2014.